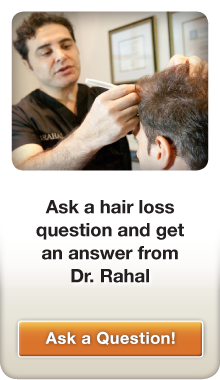 You are here: Home / Hair Loss Blog / Ask Dr. Rahal / How Many Grafts Do I Need for a Full Head of Hair? 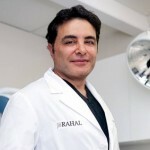 Hi Dr. Rahal. Can you tell how many grafts do i need for a full head of hair? I can send some photos if you like. Or should I just schedule a consultation at your Toronto office? I look forward to your reply. Thanks! 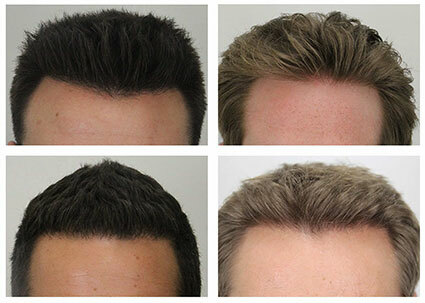 Creating the illusion of a full head of hair with very few grafts is the “art and science of hair restoration”. Here are Rahal Hairline™ examples at 60-70% original density. We first need to consider the amount of donor hair that you have, in relation to the amount of loss you have experienced to date… or may experience in the future. What i mean is that you only have a limited supply of grafts available to transplant in your lifetime… so we need to use them wisely. That’s the “art and science of hair restoration”… creating the illusion of a fuller, thicker head of hair with very few grafts. It’s really about creating more with less. Have you heard of the 50% rule? It states that when you first noticed your hair thinning under “harsh lighting” you had lost 50% of your original density. Say for example your original density is 80 grafts cm/2…. that means you noticed hair loss under harsh lighting at around 40 grafts cm/2. Under normal conditions you didn’t notice any hair loss. The 50% rule gives me a baseline… I know that I need to transplant above 40 grafts cm/2 (roughly) to create the illusion of a fuller, thicker head of hair. Though I find that 50-70 grafts cm/2 achieves maximum fullness & density… so you can style your hair as you wish — long, short, parted, or “messy”. With coarser hair, we can use fewer grafts in general to create the illusion of a full head of hair because the diameter of each hair takes up a fairly large space and provides strong coverage. Finer hair requires more grafts to achieve density due to the smaller diameter of each hair. It is the same as comparing Redwood trees to Poplar trees. You only need a few Redwood trees to fill a given area… where you need many more Poplar trees to fill an area the same size. The amount of contract between hair color and scalp color greatly influences the perceived amount of density that a result achieves. Lower contrast helps aid in the appearance of density… while higher contrast makes it more difficult to achieve an appearance of density. 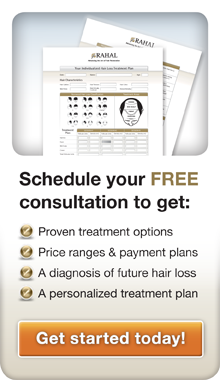 I encourage you to schedule your 100% FREE private consultation today at our Toronto location. Both in-person and online consultations are available. During your consultation, I’ll thoroughly examine your hair and scalp… and design your personalized “Hair Loss Treatment Plan™”. This amazing hair loss treatment plan reveals how many grafts you need to achieve the thicker, fuller head of hair you desire. Call us today at 1-877-551-2171! P.S. Click here for a thicker, fuller head of hair.